can you use any stem you want to for the specialized tt shiv? if you want to use the specialized base bars & cockpit, you need the specialized stem, as the specialized base bar does not have a round bar clamp. can you do it? maybe...if you're very motivated. running most stems (other than something custom) would work against the very aerodynamic benefit that one hopes to achieve by racing this frame. Whats the msrp on the shiv pro osbb frameset in Canada? i think you missed a key part of his question. the shiv TT is a 1" steerer. 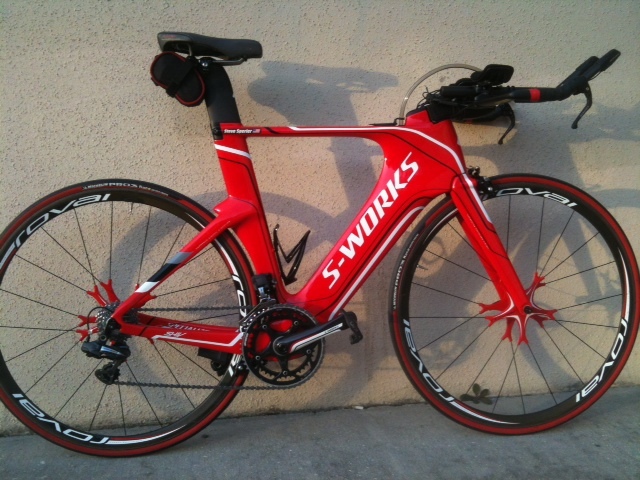 perhaps what you are thinking of -- the shiv (tri) -- is 1 1/8", but i assure you of the shiv TT spec. See move but I think most of them are a standard size and will work. I am going to use my Vuka's as Mark Cote indicated they'll work in a post above. You've shown what goes behind the stem with the control tower fairing, but my question is what goes under the stem? Or is the stem always slammed to the headtube and any extra stack that is needed is made up for in the aerobar extensions being raise ala the old nosecone Shiv? If that's the case, what are the fairings used for? Is there any chance that Specialized will create a bottle specifically design for the new Shiv (as the Virtue bottle was for the Transition)? Do you think Ultegra Di2 will be compatible with the frame? Yes the frame is compatible with Ultegra Di2 road shifters and wiring so it should be compatible if Shimano releases an Ultegra Di2 TT shifter. I sent you a pm with some specific questions about a 2012 SHIV TT a while bike. I was awaiting your answer to make a purchase decision. I still haven't pulled the trigger and I'd like to hear from you. Would you check your messages. It was back on Jan. 8.
this might have already been asked, but anyone have experience with running cables on the new frames? How difficult of a job is it for a non-bike mechanic? BLUF: Not hard...think outside the box. I built an S-Works Shiv. Running the cables was not much trouble at all. It will take some time as the housing length will depend on what spacers you use on the cockpit. I ran the rear derailleur cable starting in the middle and running out the back the working up the down tube. In the end I built the bike twice. Once with every spacer I could bolt on, with cables routed and derailleurs adjusted. Did the fit. Then tore it down to cut proper cable length. Bike built with SRAM Red and SRM. Only problem was the SRAM break levers did not fit correctly. So I do all of my research and go into my LBS (a top level Specialized dealer) in early December 2011 and order the new Shiv Comp Rival. He puts it in the computer and they say it will arrive mid Feb. I don't really want to wait, but I do, very excited about the new bike. Several good offers on other bikes float by as the new year rolls around, but I trust Specialized will come through on their promise and I pass on the other offers. I call the LBS every few weeks to make sure there are no delays, and they tell me no problem. I call the LBS today and they say that Specialized has decided to ship the Shiv Expert which is $1000 more than the Comp Rival. The Comp Rival won't be in for another month (how the hell am I to believe this?). They try to upsell me, but I am a very unhappy customer right now. What kind of game is Specialized playing here? Bait and Switch? hoping I'll drop another $1K. Not likely. How do I get Specialized to live up to their promise and get the bike I ordered over 2 months ago delivered to my LBS ASAP? C'mon Specialized, you're better than this. The upsell part is really odd and crappy. As for missing the promised delivery date of an all new model ... gee, that never happens (pink). In 2008 I waited nearly 5 months for a Transition Pro. The ETA kept getting pushed back. Hmm, maybe time to start considering another brand. As for missing the promised delivery date of an all new model ... gee, that never happens (pink). Yeah, maybe my expectations where out of whack. Why bother giving you a date if you can't deliver on that date? Or is it really just a matter of building up the bike with higher end components? i thought the original ship date for the comp was end of feb / early march. as far as i know, no comps have been shipped yet (there would be pics on ST of one if they were arriving in shops). plenty of elites, pros now though. comps were last to be shipped. Here is mine if you missed my initial post. Still needs some tweaking,race wheels and other small things. That's a beauty - which Shiv model is it? Good to know - where did you hear those dates? Wondering why my LBS is out of the loop. from my LBS - and from various posts about the new shiv around here that's what i've gathered. as far as i know specialized hasn't changed any shipping dates (but i don't work for specialized) - the sworks and pros have arrived on or near on time. I spoke with a Specialized rep last Thursday. He said the first Comps should arrive this week (Specifically, Feb 6th or 7th). However, today's the 8th and I'm still waiting for a call from the bike shop.